Following a delayed flight from Rwanda we finally arrived into Kilimanjaro but our driver was no where to be seen. A helpful guide at the airport worked out who we were supposed to be meeting and gave him a call. Granted our flight had been delayed but when our driver finally appeared he made no attempt at an apology! I quickly noted that night driving in Tanzania is something that should be avoided. Many of the vehicles, particularly the large slow ones, had no rear lights meaning you were right on top of them before you knew it. And almost without exception oncoming traffic would blast us with main-beam headlights resulting in our driver responding in kind. We reached Moivaro Lodge shortly after 22:00. Thursday 6 June Just 7 hours after checking in, we had an early wake-up call and found our driver waiting to take us to Arusha airport for our flight to the Mahale airstrip. With the benefit of daylight I could see that Tanzania had quite a different feel to Rwanda. By contrast Rwanda seemed far cleaner and more modern, despite the atrocities it had suffered just a few years ago. Clearly we had only had only seen a small part of each country so the reality might be a little different. 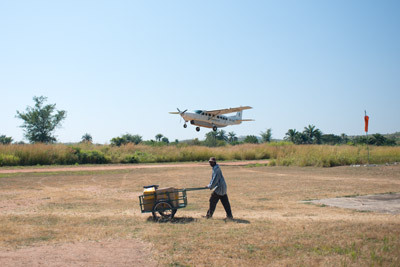 In addition to our two pilots we were accompanied by two members of staff from the Greystoke camp on our three hour flight across the north of Tanzania. We came into the air strip very low, just clearing the tops of the preceding brows. Once our plane had left for the return flight we started a one hour boat journey along the eastern rim of Lake Tangynika to the camp we would be calling home for the next 4 nights. The lake was huge and certainly felt like an ocean – 676 km north to south although just 50 km east to west - on a clear day you can see the shores of DR Congo to the west. 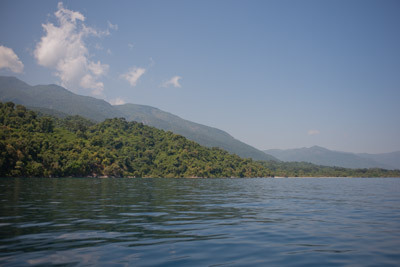 With a maximum depth of nearly 1500m it is the second deepest lake in the world. Accompanying us on the boat were 4 people from France who would be our trekking partners for the next 3 days. We finally arrived at the Kungwe Camp. 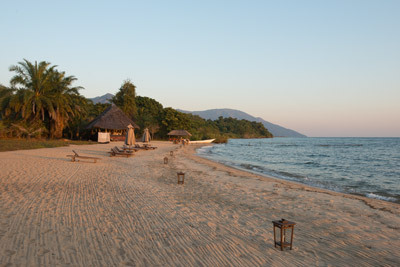 It was much like the camps we knew from safaris in Botswana, but was unusually located on a beach. We were staying in a cabin ideally located at the end of the beach, giving us the perfect view along the waterfront to the cabana. 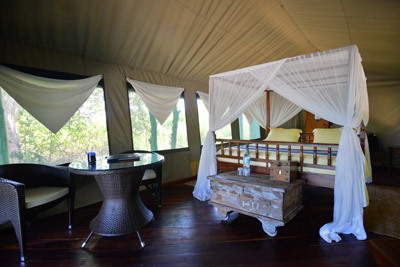 The interior of the cabin were also very similar to those in Botswana… 'basic luxury' if you like! As the sun set, the staff placed lanterns along the length of the beach. We all gathered around a camp fire in front of the cabana, drank iced tea and nibbled on popcorn and roasted cashew nuts. Friday 7 June At this time of year, food in the forest around camp is scarce, forcing the chimps high into the mountains. Unfortunately for us, this meant much longer hikes. We had a 6:30 wake-up and started our hike at 7:30. As we travelled, our guides received updates from the trackers already in the mountains. Unfortunately, much like the gorillas, they continued to move and change direction as we approached. In order to catch up with them we had to create a number of new trails scaling up the sides of some extremely steep slopes, clinging onto roots and branches as we went. Particularly challenging was the need to crawl beneath bushes as I found my rucksack continually snagged on the branches. On the plus side I was pleasantly surprised to find the forest relatively cool, even at midday. When we finally came close to the chimps we had to put on surgical masks – this was to help reduce the risk of passing on diseases - given the strong genetic similarity between chimps and humans. We were pleased to find them in relatively open space. The first we spotted was known by the name 'Darwin' and was sat in the branches at the top of a tree. We soon spotted further chimps sat beneath bushes and in the branches of the surrounding trees. Once the chimps decided to move on they filed right passed us. Only a few minutes later a group from the Greystoke camp arrived at our location. Half of them had not yet seen any chimps and they would unfortunately be returning to camp following an unsuccessful hike. Soon after starting the hike back to camp, Sixtu broke out the sandwiches and left us to eat while investigating where the chimps had gone. He spotted them on the other side of the valley – it was too far to reach them that day but it would be the starting point for the folioing morning. Our hike back to camp was only a little easier. We still had to navigate some extremely steep terrain and the decent was even harder. We were amazed that Pierre (a man of 74) had been able to keep up the pace the whole way – even at half his age I had found the day to be tiring. Back in camp we heard a little more about the other animals that we might see. In addition to being teeming with water snakes, the lake also had crocodiles and hippos, although the hippos were normally found about a km down the beach. There was also a resident leopard in the area that had been caught on the camps trip cameras. Saturday 8 June Sixtu felt that the chimps were likely to be near where we had left them the previous day, so we had another 6:30 wake-up for a 7:30 hike. One of the French couples decided that the previous day had been challenge enough and spend the day in camp. Pierre and A? were however up for round 2! We were able to take a slightly more direct route and avoid the need for scrambling up the near vertical slopes, but it was still quite a distance. We paused near the top of one of the hills and as we waited, the chimps started to call. They had moved around just below us. We approached and found them relaxing beneath bushes and swinging through the tops of the trees. We watched a number of the chimps gather together for a grooming session. At 51, the chimp on the left (in photo #10 in the above gallery) was the oldest member of the group. We also spotted a couple of juveniles (3 and 5 years old) and a baby of only 3 months. On the way back down we reached a stream and as we crossed, 3 chimps passed by. Tammay managed to get this photo of me mimicking the stance of one. Just after we moved on, Pierre unfortunately caught his forehead on a low branch. 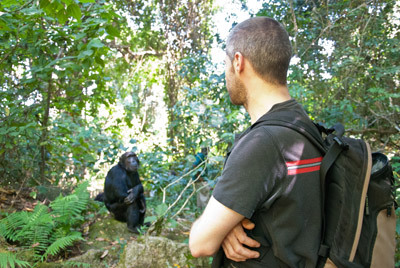 As he received first-aid half a dozen chimps came along the path behind us and passed by. Following our late lunch we headed back to the room for a much needed shower but unfortunately had no hot water. After around 45 minutes of investigation 3 members of staff discovered warthogs had chewed through the feed pipe! Sunday 9 June Sixtu was hopeful that the chimps had continued their move towards the lower ground closer to camp. It meant we could have an extra hour in bed. We took a small boat south from camp, spotting a couple of hippos along the way. Things looked as though they were about to go pear-shaped when the outboard motor suddenly stalled and refused to re-start. Thankfully it turned out that the pipe from the fuel pump had come off and it was easily fixed. 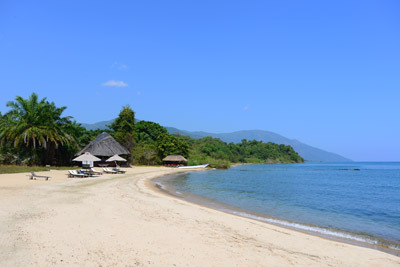 As we trekked into the forest from the beach we were unable to hear the calls of the chimps. 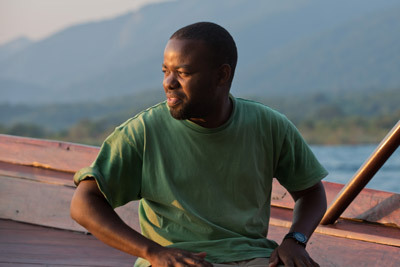 On a couple of occasions Sixtu left us with Prosper and went in search of the elusive animals. Unfortunately we were not able to locate the chimps on our 3rd day so turned toward camp and hiked back. We spotted a number of things along the way including relatively fresh leopard droppings. Is it wrong that this didn't worry me? At 16:30 we went back out on the lake, this time in the larger boat. The idea was to see more of the hippos and hopefully some crocodiles, but unfortunately we saw neither. It was however, still a very nice relaxing trip along the lake. That evening we all gathered around the camp fire for one final time and were joined by Sixtu and Prosper. 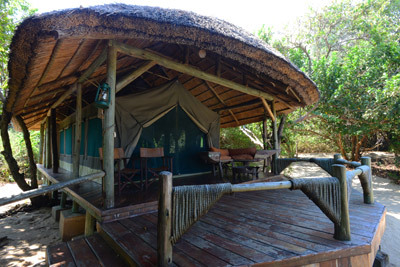 As we were talking, the camp manager jumped up proclaiming that he had seen the leopard at the tree-line. I could see a pair of eyes looking our way but couldn't tell what animal it was. We quietly walked over (clearly letting Sixtu lead the way) but were not able to see any tracks. The camp managers were a little crazy so I think it might just have been a warthog! Our final dinner was together as a group on the beach. The fish had been caught by Pierre (other Pierre) the previous day. Monday 10 June Thankfully we had a later start. 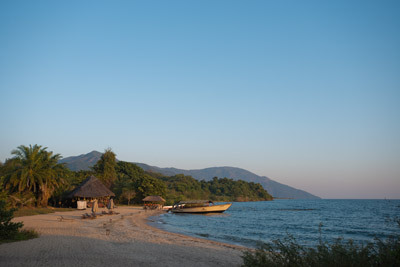 One last breakfast at Kungwe and it was time for our boat transfer to the Mahale airstrip. There were going to be no guests in camp for the next few days so many of the staff accompanied us on the boat. It was about a half hour wait for our plane to arrive. The return flight to Arusha airport was made via Tabora airport where we re-fueled. During the second leg of the flight we passed over the steep 'cliff' of the Rift Valley on the west shore of Lake Eyasi. Unfortunately it wasn't quite clear enough to see the Ngorongoro crater just to the north. 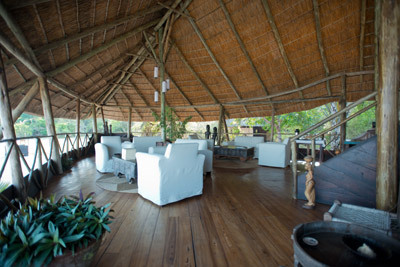 Our driver met us at the airport and took us on the short drive through the centre of Arusha, back to the Moivaro Lodge. Our room this time around was not quite as nice and was clearly suffering from a little damp. I couldn't even strike the matches to light the open fire! Tuesday 11 June A quiet final day of our holiday. 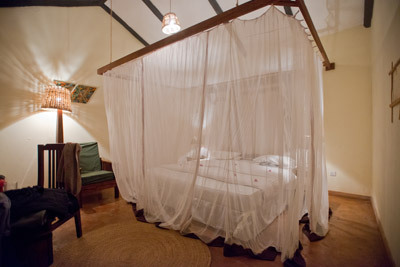 We decided to ask for a late check-out and spend the day at the lodge rather than travelling into Arusha. We took our transfer to Arusha airport for our flight to Nairobi where we once again changed planes and made our way on to London Heathrow.